Home» AP LATEST UPDATES » AP Implementation of 100 percentage Biometric attendance by the end of March 2018. 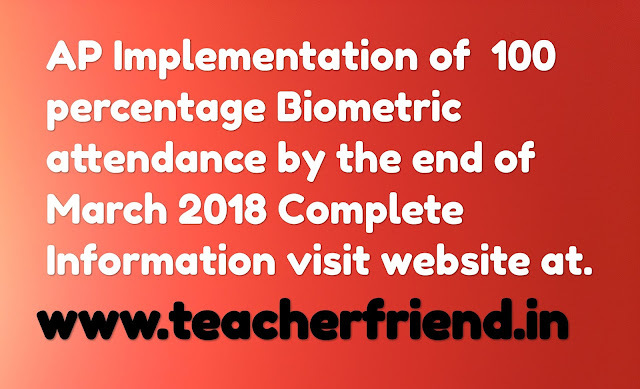 AP Implementation of 100 percentage Biometric attendance by the end of March 2018. AP Implementation of 100 percentage Biometric attendance by the end of March 2018 by operational in paperless mode e-office and ensure 100% biometric attendance in all Government head offices with effect from 01-04-2018 as per UO.Note memo 58022/7/2017,Dated 19.03.2018. AP Minutes of the Video Conference or Biometric and e-Office held by Chief Minister on 09.03.2018 forwarded through UO Note Memo, No GAD 58022/7/2017 SEGY POLL GAD dated 19.03.2018. By the Hon'ble Chief Miniate on 20.12.2014 he Secretarial Departments The office biometric system stem hes been extended to the initially in Heads of Departments and the District Offices in the phased manner vide GOMs No. 149 GA (PUA) Dept., dated 18-12-2017 Subsequently Government made it mandatory the implement the e-office system and Biometric attendance in Secretariat, Heads of Departments in Autonomous Organisations and all the District Offices in the State in order to provide transparent, efficient and time-bound services to the public. The Government there are, hereby instruct that the all thr Government Office in the State should open any physical file and no manual attendance shall be maintained w.ef. 01-04-2018. AP ensure 100% biometric attendance with effect from 01-04-2018. All the Secretariat Departments, Heads of Departments, Autonomous Organisations, District Collectors and District Offices shall strictly ashore to the instructions of Government and any violation in this regard will be viewed seriously.